On entering the town of Oudtshoorn we were welcomed by hundreds of ostrich farms as far as the eye can see. In fact, Oudtshoorn boasts over 400 Ostrich farms. The area is dry but possesses a certain inviting atmosphere. Oudtshoorn is enchanting with lots of old Victorian homes, gorgeous gables and antique stores. Oudtshoorn certainly took us back in time where ox wagons were the means of transport and the women wore rather warm dresses. Here in Oudtshoorn you will get the sense that this is a community where everyone knows everybody else’s business. A small town like this is all about friendship, family and living together as one big community. The climate in the Karoo Region is incredibly warm and dry. Even so, Oudtshoorn surprisingly boasts a few fantastic wine farms including Boplaas. When we arrived at these wine farms, we were welcomed with dried and sweetened fruit pieces which are very popular in this area. The people here are always very hospitable and you will find plenty of excellent hotels in Oudtshoorn offering warm South African hospitality. We explored The Cango Caves, Crocodile farm, Ostrich farm and the Cango Wildlife Reserve. The Cango Caves is truly a marvel! It lies in the Swartberg Mountain range, which is a Heritage Site. The Cango Caves are situated in a lime stone belt measuring 1.5km in width and almost 16km in length. The Cango Caves were originally inhabited by the Khoisan peoples thousands of years ago. It is a truly mystical place. 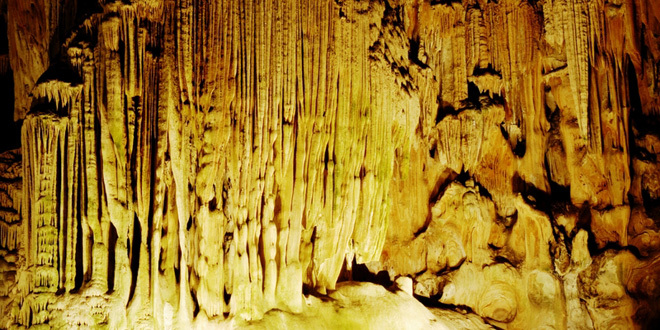 Only the main section is open to the public in order to preserve the majestic formations. The limestone formations are fascinating! There are certain parts where we had to get on all fours or even crawl around on our stomachs in order to see all the viewable areas in the cave. It is definitely an exciting experience! The Crocodile Farm forms part of the Cango Wildlife Reserve. The entrance is a giant Croc’s mouth wide open making you feel as if you are entering its belly instead of the actual farm! The croc’s here are enormous and rather scary. To get really close and personal, one can now go Croc Cage diving! After we visited all the lazy crocodiles, we were lead to the wildlife reserve where we got to admire cheetahs, lions and tigers. There are a few Ostrich farms that host shows and boast a few curios shops. We decided to take a visit and ended up purchasing large ostrich eggs and jewellery. After viewing a few of these amusing creatures, we watched the ostrich show. Here, a few people from the audience are invited to race on an ostrich against others. This is when our trip became the most amusing! One poor gentleman was completely thrown off and landed on his back. The other gentleman’s ostrich decided to stop during the race, excrete a few things and then carry on. The problem was, when the ostrich decided to suddenly stop, this gentleman was flown right off. Although we were amused, he most certainly was not! Our trip to Oudtshoorn was definitely a memorable one. Outshoorn may be small and quaint, but it is certainly a worthwhile destination.